Pilgrimages are supposed to bring one closer to God. 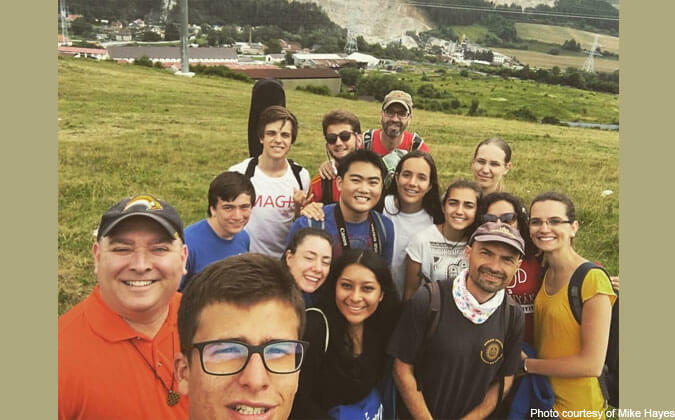 “You can talk or you can pray while you are on a pilgrimage,” advised one Polish Jesuit, and many of us on the journey to MAGIS and World Youth Day 2016 did a smattering of both throughout nearly three weeks in Poland. MAGIS is the Jesuits’ precursor to World Youth Day and consists of bringing students from Jesuit schools all over the world together to pray with one another and prepare for our time with the rest of the global Church and with the Holy Father. High-energy praise and worship sessions along with morning prayer, Mass, and evening vigils are some of the activities, but it is mostly a chance to get to know other pilgrims from across the world, as well as the folks you travelled with from your own school. 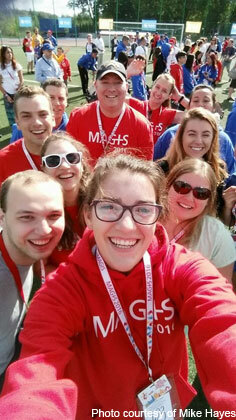 The opening day of MAGIS, in short, was a blast. My students were pretty engaged in the music and prayer, and we began to make friends from literally all over the world. We reflected on Ignatius’s prayer for generosity, especially on the line “To give and not to count the cost.” Do I withhold generosity from some in my life? Am I too busy counting the costs of friendships, mentorships, or relationships? All good things to reflect on with Jesus. Others too had amazing experiences: Rachel became a clown and did street performances and made balloon animals. Ellen did a whole lot of singing and stretched her comfort zone with that. Helena’s experiment took her to a picturesque village and allowed her to experience God in photography, while Megan sculpted her own hands and face and learned how God has joyfully made each of us and how we are all images of the divine, despite the things we find imperfect about ourselves. I was sent to Slovakia to follow in the footsteps of a Jesuit novice named Tomas Munk, who was a Jewish convert and who was literally pulled out of the novitiate by the Gestapo and placed on the death march with his father. Dying for two religions, Munk was a gentle soul by reputation, who died unjustly at the hands of the Nazis. Our days were filled with prayer in the morning and then afternoons were spent walking in Ruzomberok, where Tomas lived. These were mostly touristic sessions and provoked a lot of laughter from our group. When we ate ice cream (or lody, as the Polish call it) we would joke, “Tomas Munk did this.” We learned that the personal physician of Leo Tolstoy was a resident of the town, so we would make up stories about Munk and Tolstoy’s doctor. Munk’s family loved the Slovakian mountain ranges, so we too hiked into the mountains (some rode scooters down!) and we generally enjoyed each other’s company. We had this great sense of coming into the experiment with nothing more than ourselves and then leaving again, with nothing more—but most importantly—nothing less than ourselves as well. I made a bunch of great friends, especially my MAGIS circle group, who shared deeply together in the evening hours. 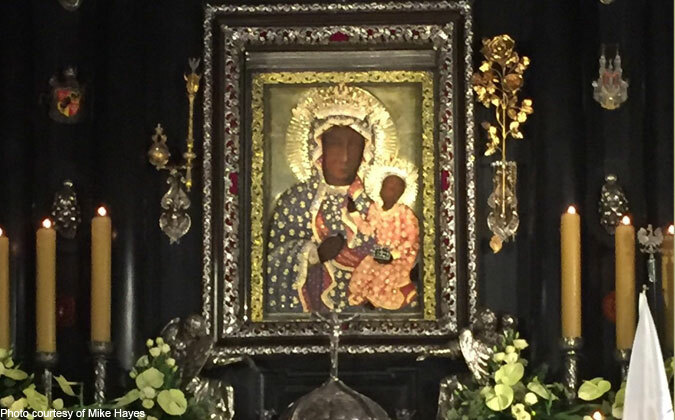 We visited the basilica in Czestochowa and saw the icon of Our Lady, the famous black Madonna that reportedly was painted by St. Luke (though its roots are questioned by most historians). It is undoubtedly beautiful, and I was lucky enough to be able to sit silently in front of it with a student from my experiment for about a half hour in prayer. We said absolutely nothing to each other, but it was one of the more prayerful moments in my life. The evening’s Reconciliation service was also quite prayerful and included Confession and exposition of the Eucharist. A big thank you to all of you who submitted prayers to me. I was able to print your e-mails and I left them with Our Lady’s icon after reading all of them and praying with you throughout my time in Poland and Slovakia. Finally, we concluded MAGIS on a high note with the Festival of Nations and a rousing closing ceremony. It was difficult to say goodbye to our new friends, but we were also glad to be going to pray with the Pope. 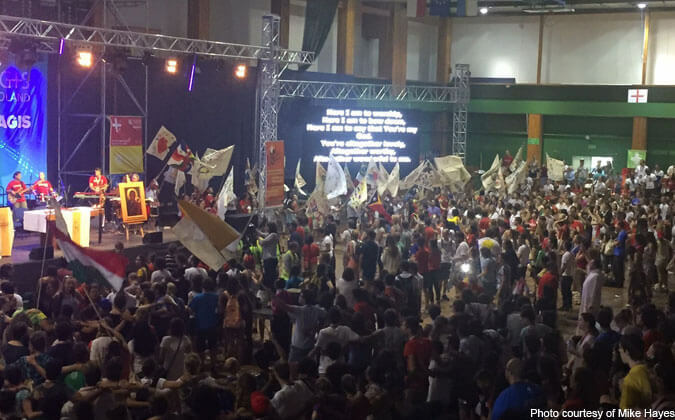 Logistical problems are always huge at World Youth Day, and this year was no different. Krakow was pretty unprepared for the huge numbers of people. The trains were more than congested, food lines were long and unorganized, and trams and buses were often impossible to board. However, my students did not let this deter them. They laughed in the face of stress most days. We had amazing reflections in the evening and made contingency plans when things didn’t go as we hoped. It was hysterical and wonderful to be with these folks, and I will treasure our travel together for a long time. We truly enjoyed the papal welcome, and the energy in the park was electric. We listened to Pope Francis all week at World Youth Day. The Stations of the Cross, the evening vigil, and the papal Mass all focused on mercy, but also on not accepting complacency. Pope Francis challenged us to change, to not accept the world as it is, and noted that this would be uncomfortable for us. He told young people not to become old before their time and be boring; rather to awaken the Church with their gifts and their vibrant passion was a key message he wished to transmit. He also reminded us that it is not always comfortable to be Catholic. Often our faith pushes us to be uncomfortable, especially in caring for the needs of the poor and vulnerable. That was another great challenge that sprang, not only from the Pope’s message to embrace God’s mercy in our lives, but also to be mercy, to live mercy, to give and not to count the cost. Lastly, we walked. Rachel, one of my students, and I walked 20 miles on the day of the papal Mass alone. We couldn’t sleep under the stars because of illness, so instead we decided to just get up early and walk to the Mass. One problem: the buses and trams stopped running because of the papal motorcade. But lucky for us, the motorcade found us. Amazing! And on our return, the buses and trams were overflowing. So off we walked again, in the rain this time. While an arduous journey, we laughed a good deal of the way, and it gave us a good opportunity to reflect further on our time together. Thanks much for all of your prayers throughout our time in Poland. Looking forward to MAGIS/World Youth Day again in Panama in 2019. Mike Hayes is the Director of Campus Ministry at Canisius College and the founder of BustedHalo.com. He is the author of two books: Googling God (Paulist, 2007) and Loving Work (Orbis, 2014). He served as the principal editor for and co-wrote The World Youth Day Retreat Guide (USCCB, 2016) with his colleagues Becky Eldredge and Beth Knobbe. He attended MAGIS from July 15–23 in Lodz, Poland, and then World Youth Day with Pope Francis from July 24–31, 2016. Mike has been happily married to Marion since 2002, and the couple live in the Buffalo suburbs with their chihuahua, Haze. Our young people – they are the future leaders and torch-bearers of our Society and the Planet.